My name is Tony Clark and from a child in the 1950s I have been interested in motoring art, collecting clippings and pictures from magazines. I particularly liked the Crosby illustrations that were occasionally in The Autocar, the Russell Brockbank cartoons every week in The Motor and the occasional motoring colour cutaway as a centrefold in the Eagle comic. (I still retain some of the printed Brockbank cartoons of the adventures of Major Upsett that I cut out of the magazine). Growing up I had a battle between academic studies and art college but study won and I went on to do a degree in Civil Engineering and become a Chartered Engineer. I married my wife Anna in 1968 and have two daughters. I worked for Consulting Engineers on many studies worldwide but some of the most interesting were the hydroelectric power and mining projects in Zambia. I frequently visited Zambia and lived in the country with my family for over four years in the 1970s. On return to the UK I started to acquire original motoring art and kept a record of artists. This database has developed over the years and with retirement at the end of 2005 I now have the chance to publish this listing. I originally intended that this would be a book, the first part being an update on the Tubbs work - Art and the Automobile. The second part of the book would be the artists listing in a similar format to the excellent dictionaries of artists put out by The Antique Collectors Club. I have now decided to publish on the internet as I feel that I will receive more feed-back and information this way. The intention is that this listing will continue to grow particularly with information about the earlier artists. If you are able to assist please contact me. I am not really seeking to expand the listing of current artists, I am sure there are several hundred people around who could claim to be motoring artists. Over the years I have written many articles on motoring art and profiles of individual artists for various UK magazines. I am the Continental Correspondent for the Bulletin of the American Automotive Fine Arts Society (AFAS), writing a couple of articles each year. In the past I have acted as a Consultant to a major UK auction house for the lotting of art in the sale of the Autocar/Motor archives. I do occasionally take stands at motoring shows to buy and sell duplicate material. In the past I have taken space at the Goodwood Revival meeting and the September Beaulieu Autojumble and when attending such venues I always look forward to meeting old friends and making new acquaintances. 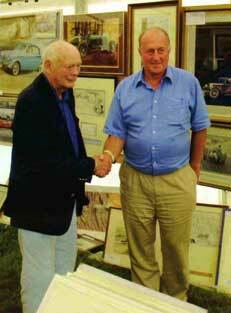 This is me (on the right) being congratulated by Lord Montagu of Beaulieu for having the best stand at the 2006 Beaulieu International Autojumble.